Aquarium researchers and staff are on expedition to the remote Phoenix Islands Protected Area (PIPA) to study the natural history of the islands, surrounding reefs and connecting open water ecosystems. Research on the 2015 expedition will directly inform the management and maintenance of this world-renowned MPA. Today's post comes from Sam Payet. 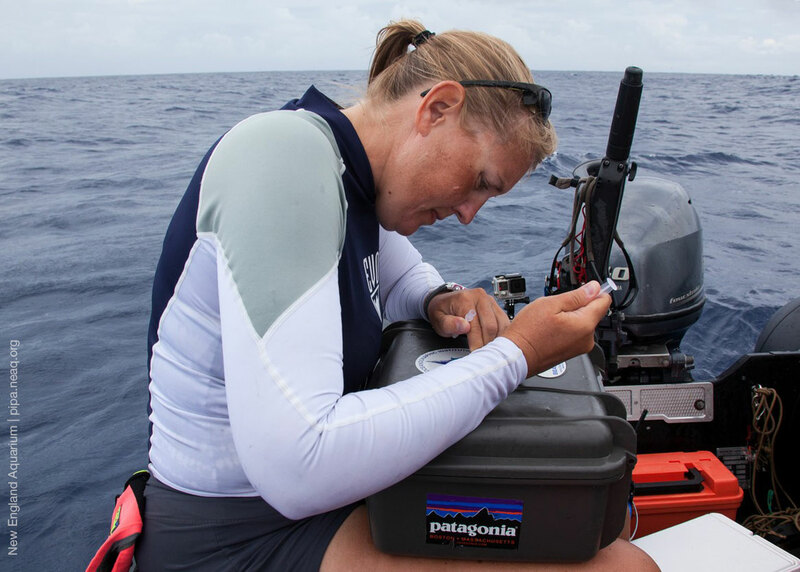 Unlike most researchers, sharks are most active during early morning, so the team is begrudgingly up around sunrise, allowing enough time to pack breakfast and begin fishing. The shark’s reputation for being an aggressive predator would have most think they are easy to catch, yet fishing for sharks during this expedition has been a challenging and rewarding experience. The first step is to find the sharks. Typically, we will “burley up.” This involves throwing some chunks of fish in the water to attract the sharks and get them excited. As the intern, it’s my job to jump in with the hungry sharks and spear the bait. Handlines with non-barbed hooks have proved to be the most successful and unobtrusive method. When targeting gray reef sharks (Charcharhinus amblyrhynchos), the team usually heads to the reef drop-off. At McKean atoll, up to twenty grays can be observed at a given time – a sight that will really make you feel insignificant if you wish to dive with them. 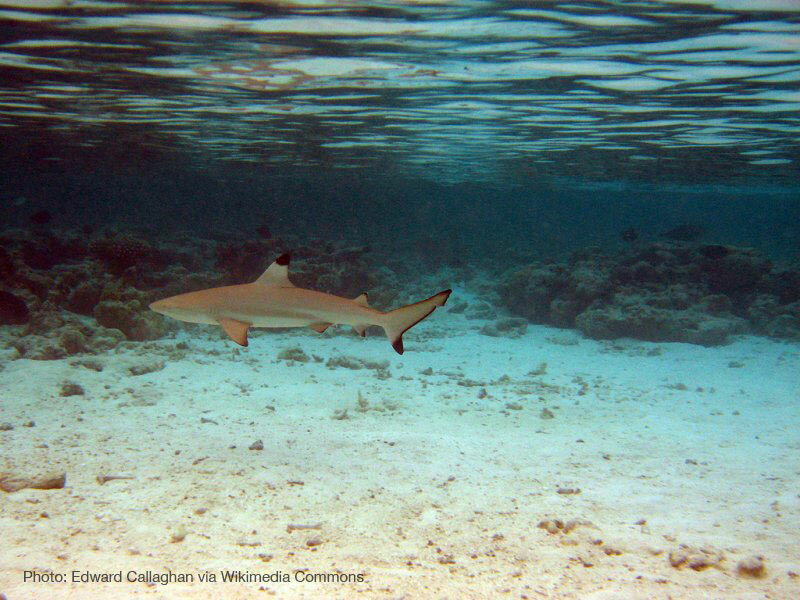 The black tip reef shark (C. melanopterus) is more common in shallow waters, and most have been caught on the reef flat or in the lagoon. Once a shark is caught, it is brought alongside the boat. It usually takes two people to restrain it and a third to collect data. Most sharks are around 1.5 meters, with the largest to date being a 1.75 meter female gray. Reef sharks have rows of serrated teeth that allow them to cut through flesh, so it’s really important to watch your hands, especially around the flexible and sassy blacktips. At this stage the shark is usually put into “tonic” – a relaxed and calm state that’s induced when the shark is rotated upside-down. Following this several measurements are taken, tissue and blood is sampled and the hook is removed. Then, the shark is given a quick tickle to awaken it and released. The whole process takes around 3 minutes. The data collected on gray and black tip reef sharks will, amongst other things, help us understand how energy flows through marine food webs at Phoenix Islands. It will also provide the basis of genetic studies to see if there is connectivity between islands, there will be a forthcoming post on this. The team are also interested in fine scale movement patterns of reef sharks, and have been inserting acoustic receivers in sharks caught at Kanton and Nikumaroro. Blood samples have also been taken to develop a reference value to compare the health of captive sharks, read more on this here. 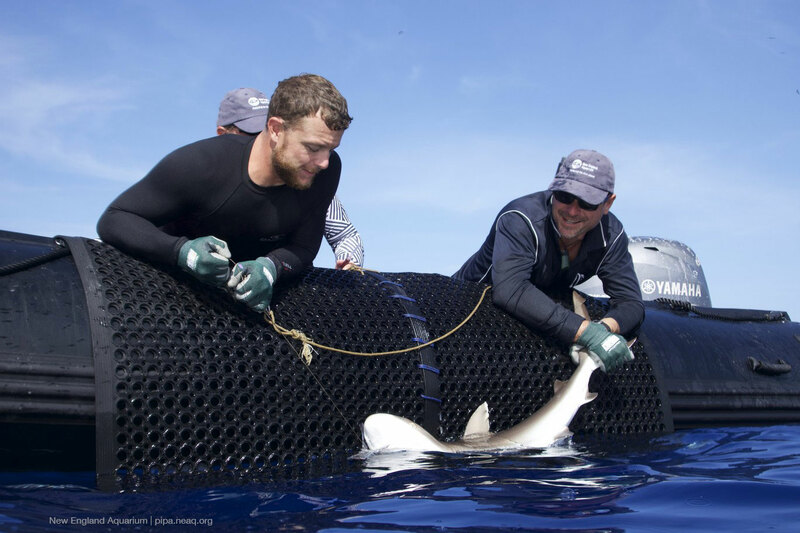 The researchers have already captured and released over 160 sharks with one very sharky island still to go. 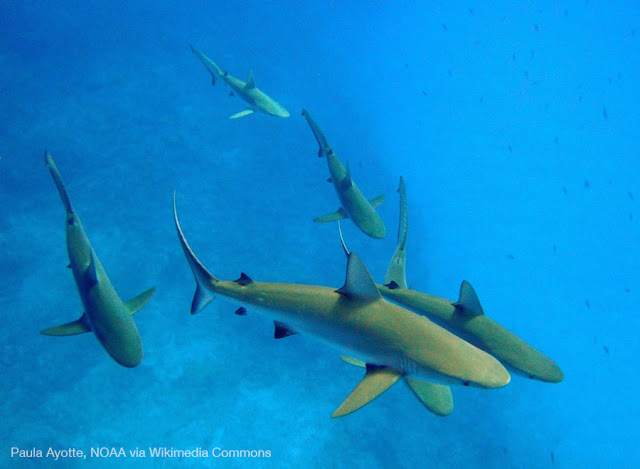 Their work during the 2015 PIPA expedition will provide insight into the resilience of reef sharks to human impacts like climate change and overfishing. Sam Payet grew up in a small town on the North-West coast of Australia where he spent much of his childhood fishing, diving and camping. He lived here until the age of 15, before moving to the South-West region to finish high school. Owing to his fascination with the ocean, Sam enrolled to study Coastal and Marine Science at Curtin University, Perth. 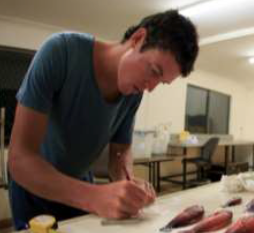 Upon finishing his Bachelor Degree, Sam completed an honours year where he studied hybridising reef fishes at Cocos and Christmas Islands in the Indian Ocean. Sam is currently a research intern at King Abdullah University of Science and Technology (KAUST) in Saudi Arabia, he hopes to build on his experience before considering a PhD in the near future. Sam’s main interests are fisheries ecology, conservation.